Description: NS M-75 is headed up by 2 ex Conrail units just south on CP-79 on the Marion Branch. Description: Power of H 12 heads down the connection from the Southern Tier to the ex LV on its way to Sayre. The Southern Tier Line swings off to the left. 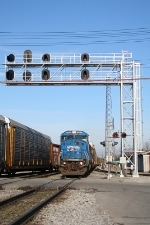 Description: Westbound at CP MO. Description: NS 6802 leads this loaded coal train west. Description: NS Eastbound Intermodal Train 24G rumbles through Tallapoosa, Ga. Description: NS Eastbound Intermodal Train 24G running around 24E at Tallapoosa, Ga. Description: A close look at SD60M 6802. Description: Horse head D9-40CW 9812 leads SD60M 6802 (still in Conrail paint) with a westbound stack train. Description: 6802 is the trailing unit on 11E. It must have new trucks. I have never seen trucks this clean on an SD60. Description: Making an unscheduled stop, this eastbound is stopped at the beginning of the Mainline Metairie corridor in Metairie. Description: Ex-Conrail SD60M speeds by my school at 11:30. Description: Another shot of this beautiful blue beast. Description: NS 630 crossing Packer Street in Sunbury. Mixed NS/CR hoppers. Description: NS 630 through MP 242 south for Harrisburg, PA (well technically Baltimore terminal). Mixed NS/CR coal hoppers. Title: NS 631 Northbound with NS 6802 in lead! Description: Northbound on main at South Fair with a pair of ex Conrail blues. Description: A prime example of why I HATE it when railroads build sidings at a lower level than the mainline.